A beautiful (portable) book on a less-seen but vital part of our world. I read this when I was starting a freshwater project a while back as it helped me into an area I knew little of. If you're concerned about Earth; a geologist, zoologist, ecologist or simply want the gist of how part of nature works this is a great place to start. It's one of the most readable pieces of nature writing I've seen in years. Also has a helpful bibliography. 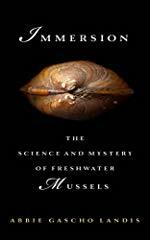 'Immersion' is as much a reference to the authors' experience, and her approach to the watery habitat, as it is to the way mussel-thinking can expand outward to our world.